This dude has a great attitude. You go, fella. Is it just me, or has it been a long time since the last time some whack-job (or group of whack-jobs) tried to convince everyone that the end of the world was coming rather shortly. Whenever one of those dates comes along, B and I have a wine and cheese party to celebrate. I sure would like another excuse. Two years ago, Harold Camping predicted the world would be judged May 21, 2011 and Christ himself would return to earth. This did not happen and the con artist changed his story to it was a secret judgement and the real judgement would then be October 21, 2011 when the world would end. After proven wrong again, he claimed no one can predict the end of the world….. funny since he tried pulling this scam in 1994 as well. He has not tried anything since (and since he is 92, doubt he will) but I continue to keep tabs on him just in case (he did mange to con entire life savings out of many) he tries one last time. I hope the verbal reassurance something unfortunate may happen if he does it again is sufficient enough to make him stay quiet until he kills over. On a lighter note, were I to see a guy with that sign, I’d toss a few dollars his way and tell him to keep up the positive attitude. And on both of those days, we had a wine and cheese party. There will always be people like that, sadly. And, sadly enough, I don’t think there are enough of our dear friend above. Agreed, let’s keep his smile going. Love a good single panel strip! 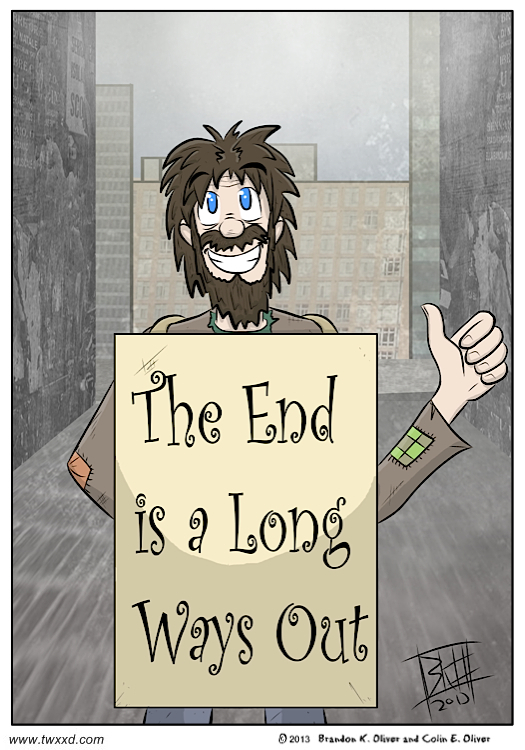 Since they are crazy when say “The end is nigh!” If we ever actually see them using this sign, you know then end is likely tomorrow.